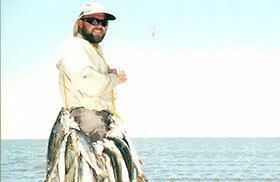 Speckled Trout Fishing Charters 35 miles south of New Orleans La. 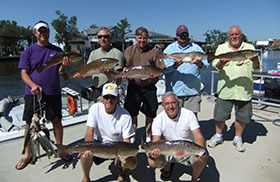 The speckled trout fishing here in Barataria Bay has been incredible so far, this summer. We are still catching very nice trout on the north side of the bay. Everything is late this year as the big trout normally this time of the year have move out to the south side of the bay and will spend the rest of the summer there. We are starting to catch some nice trout on the oyster reefs near the barrier islands for the last few weeks however they are not consolidated out there yet. Again, it is unusually to be catching big trout on the north side of the bay this time of the year. This weekend we had a full house with all four log cabins rented out to families. 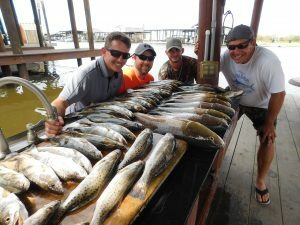 Three of the families brought their own boat and one of the families charter me for a speckled trout trip on Saturday morning. 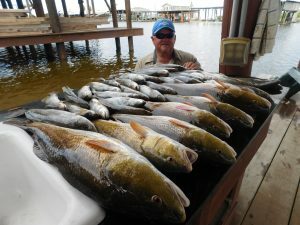 The families in the three cabins that brought their own boat did very well with fishing the red fish on the inside. Staying in the pipe line canals and shallow duck ponds they all had a fantastic time. One of the guys had never been to Lake Hermitage before and didn’t know anything about the water here regarding knowing where to go and where to fish. I spent a few minutes on goggle earth with him getting his feet on the ground as to where we were and where to drop the anchor. The first trip out the gate he came back with some beautiful red fish. 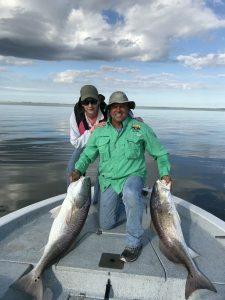 His wife was a little unsure about running the new boat in un charters waters but after the first trip and catching the red fish that they caught, she was on board one hundred percent. They fished hard all weekend catching their limit of reds just about every time they left the camp. 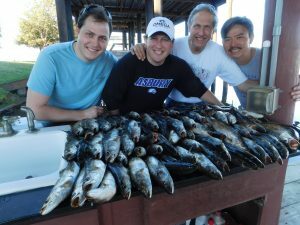 They enjoyed grilling the red fish on the half shell using the charcoal pit. 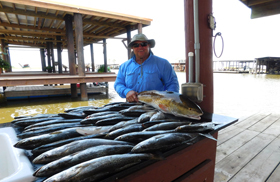 I don’t have to tell you that they are hooked and will be coming back to Bayou Log Cabins Fishing Lodge for some more fun in the sun. The second family in cabin B had a twenty-one foot all aluminum express boat with a one fifty Yamaha on the back and they could get out a little further. They decided to try and target some of those big speckled trout I been talking about. 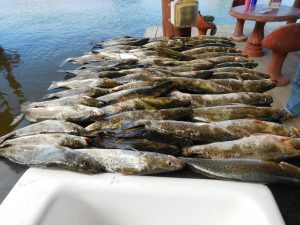 They got a five thirty departure Saturday morning and headed south towards Barataria Bay and dropped anchor at a location I shared with them and went to work catching some of the biggest speckled trout they had ever caught. Keep in mind they were from up north and of course are not used to catching big speckled trout. The father kept telling me how much he enjoyed watching his wife and two small children catch fish. He was telling me that he eventually put his pole down and just started helping them land the trout and put live shrimp on the hook so they could spend more time pulling the fish in. Now that is what I call a good dad. While it was Father’s Day weekend there he was helping his family catch a box of trout and really acting as a deck-hand for them. You hear me talk about building memories all the time with family and friends, well this is a perfect example of what I am talking about. The wife and kids enjoyed watching the marine wildlife just as much and catching the trout. Early in the morning on the way out to the fishing spot they say plenty of dolphins, pelican’s as well as many other types of wild life that you would not normally see in the city. What a perfect day on the water as they will remember this Father’s Day weekend for a long time. The folks in the next cabin charter me for Saturday morning so that Friday afternoon when they checked in they came over and perches some dead frozen shrimp from me and sat on the pier in front of their cabin and entertain themselves catching some small rat reds, sheepsheads, and drums as one of the boys was busy checking the crab nets. 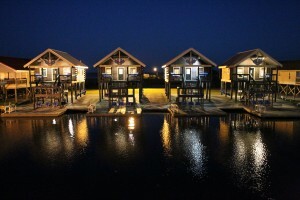 I must say that the little fellow catching crabs caught enough crabs to feed the entire family by night fall. He was so proud to have caught enough carbs to provide dinner for his family that night, I don’t think he will ever forget this weekend. Well Saturday morning came early and I picked them up as safe lite and headed south towards Barataria Bay with a slight breeze out of the southwest at about eight miles per hour. When arriving at the north side of the bay I decided to head across all the way out to the oyster reefs near the barrier islands. The first couple of spots we stopped at the water was a little dirty and we did not find much of a bite. I told them to hang in there and give me a chance to find some clean water. Seems like every time I would slow the boat down on of the small boys would look at me and say Capt. Clay does the water look good here? I know he wanted to catch some of those big trout I was telling his dad about the night before. I had to look at him and say well son it is getting better but it still is not the clean water I am looking for. He would pick up his pole and put a live shrimp on it and throw it out anyway with the hopes that I was wrong and we would find some fish. Well after five or six tries we finally found some clean water and the bite was on. 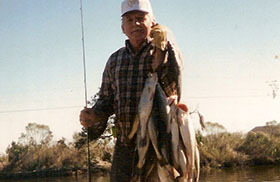 I will never forget the look on his face when he was bringing some of those bit speckled trout to the boat one after the other. Another wonderful day on the water for this family.